Crazy list of fish ken! Are you actually hooking the darters and shiners or do you trap them? #56238 Never 2 Many Gadgets ? I've been experiencing some electrical anomalies lately with the boat. Sometimes I would have to remove the bow fish finder to unfreeze it after I drove the boat from spot to spot. I found the A10 control panel would make pathetic buzz instead of the typical beep when I would turn on the livewell pumps or the navigation lights. Even my fish finders were acting up loosing bottom or showing large lines. All this lead me to think that it was about time to fix it before I got left stranded somewhere. 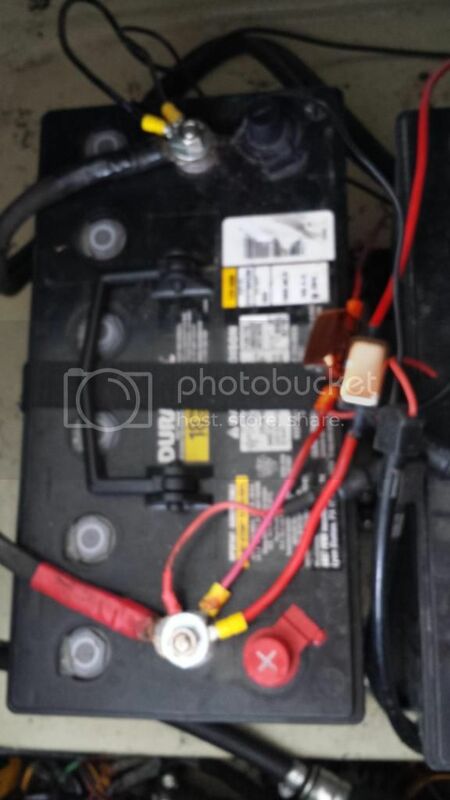 I started calculating the load I was putting on the main power cicuit and I realized that it was time to install another line from the battery to the dash area. That made me feel better nowing that I now have the electronic fish finders and the radio on a dedicated circuit. I even have room for more toys such as lights or shallow water anchors. 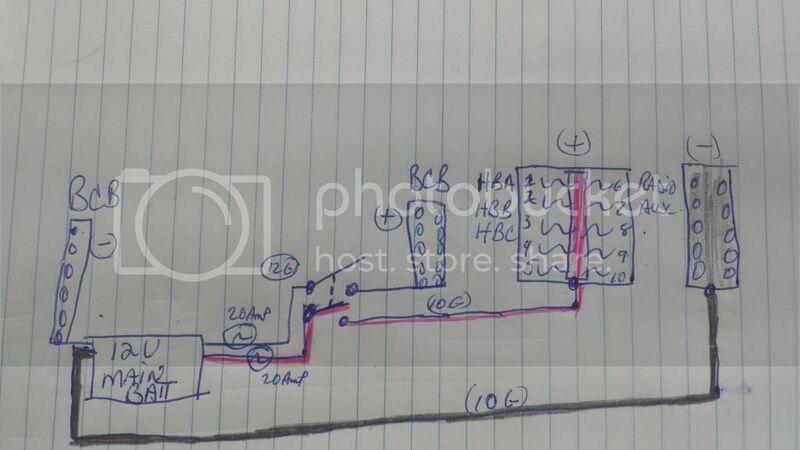 I ran everything parallel with the existing circuit and I even replaced the main power switch with a double line switch so it all looks like the original configuration. Once I was done I still had the issue. What was realy causing the problem. 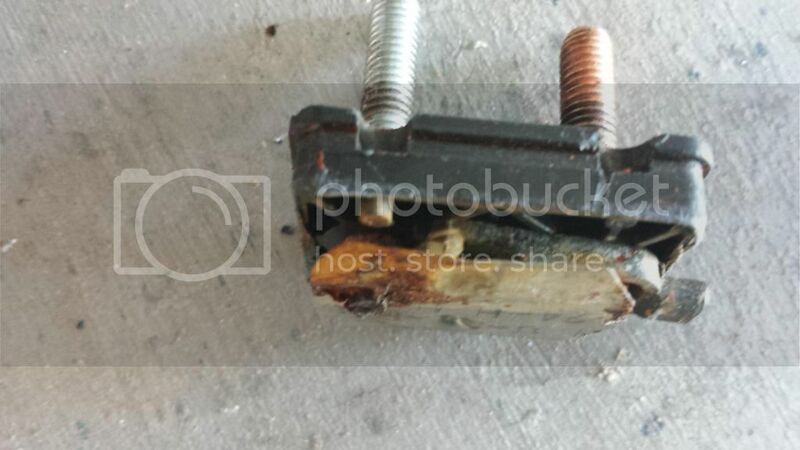 At $4 a piece I replaced the main 20Amp breaker. I opened up the old one and to my delight I found the issue. Rust. There was contact so the component measured 0.4 Ohms resistance but because of the rust any load would be met by a large resistive force. Thats why I made sure that all the inline circuit breakers are facing down and so water won't collect inside the cover. Come on guys, you gotta act fast. I have these items posted on Kijiji and I'm getting inquiries already. My prices on Kijiji is $20 more on average. I already have 2 rods spoken for! You snooze, you lose! #55540 Start of summer at my home port. This is the time of season when the kings usually arrive at my home port, Despite some slow action reports, we decided to go and greet his highness in person. 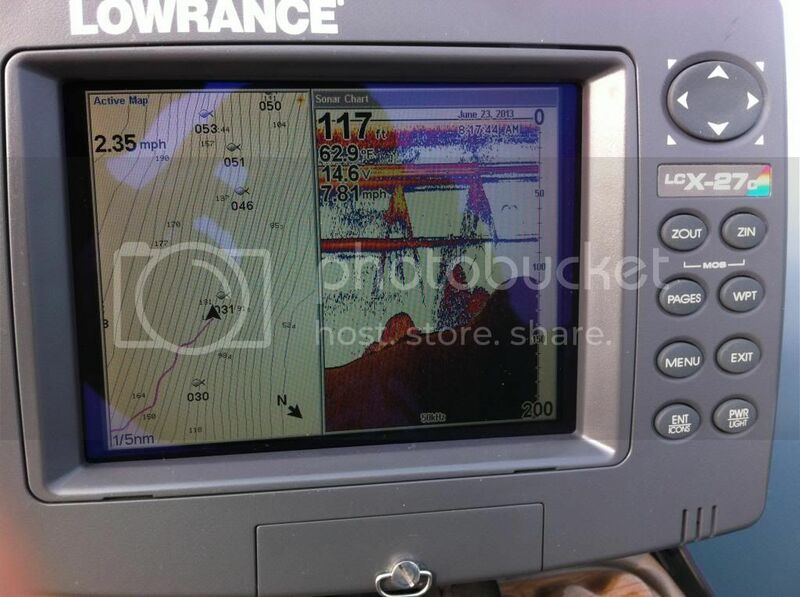 Just like last time, picture on the sonar was looking real good ! A slow day for action, but calm seas and good company made this another nice day on the water. Thanks Jay and Josh for your awesome company as always. Great report and pics Colts, had a super day after we got the battery boosted and some gas in the tank. BINGO !! You hit the jackpot on chrome. 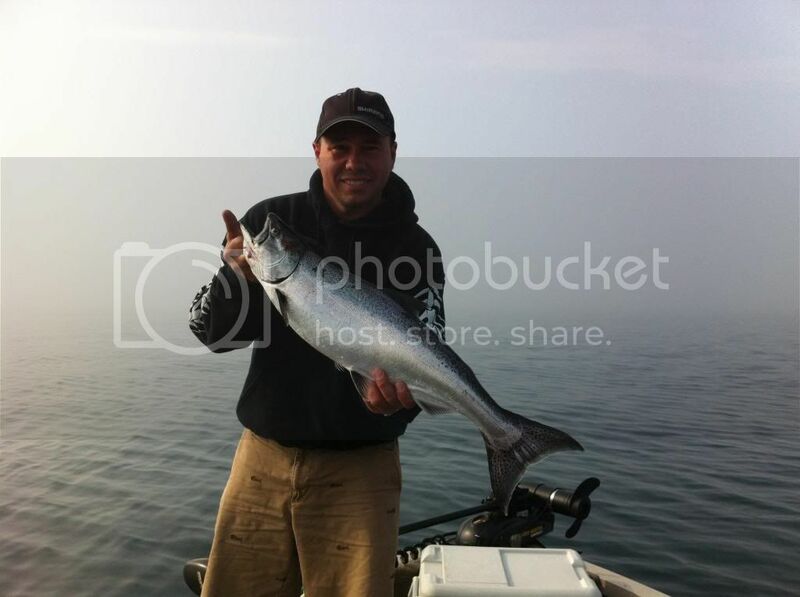 All great looking and very nice fish Steve. I have been out twice on my usual spot and its been a hit & miss........................or more like miss & miss so far. 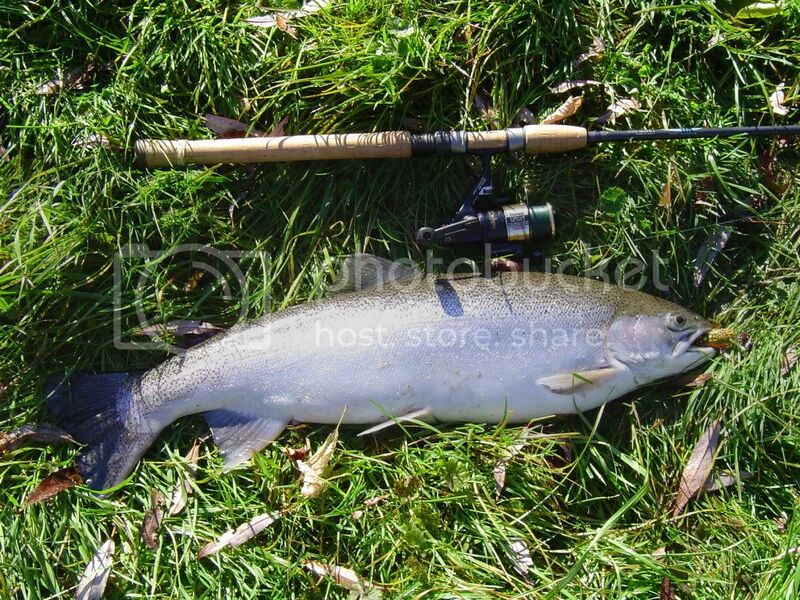 Alex, is the reel you're looking for freshwater use in your local lakes? What's he asking? Depending on what you need/want I may be able to help you as I'm sure other members here who may have too much gear and are willing to part with a good used bait caster are as well. First app is called Picup. Super fast no login required BUT doesn't put image codes in so the picture shows itself without clicking on the link. Sweet looking little lake and some chunky bass. You need to bring a freind with you to take the pictures man! Holy S"@t brother, what a great post!!!! What could possibly be better then putting those young men on so many big fish??? 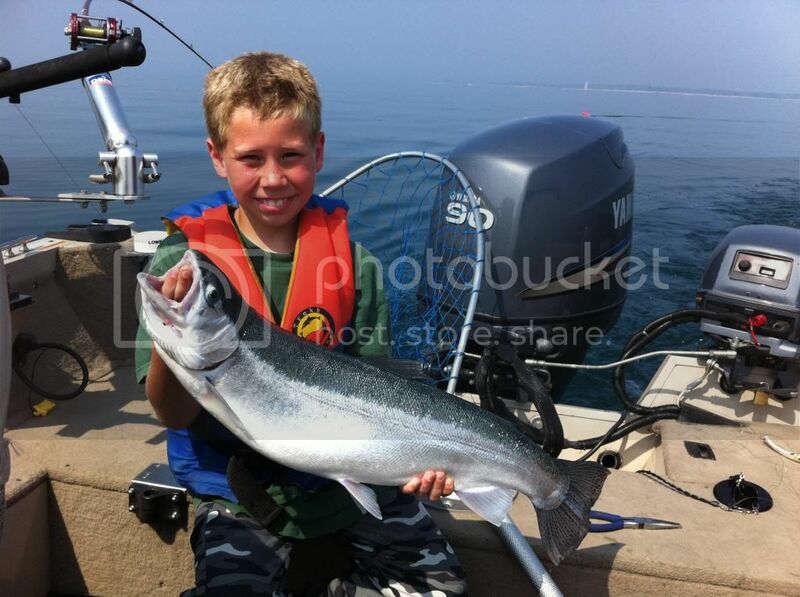 Just love seeing young kids catching fish like this. They will remember that day out with their father and you long after we are gone. Ambassador Stinger, I salute you. #54211 What do you call a blind fish? Your jokes funnier then his! Come bass opener look On line, tell me what you want, I'll get it for you and we'll go get some beauty smallies in that bOat of yours. It's a hike for you but if you ever come out this way in the future I'll give you some great water. ~~~~Sorry buds I did mean CLEAR. and if I read you right your saying if I staple my Fillets together to get 12" I can have 8 of these a month, does it matter if I mix up the right side fillet with a left side, or di they all have to be the same. Saw a few 14 and 15". Caught a crapload of dinks. Was bouncing my jig off the backs of the Jumbos but they had no interest. They just came in. More to come..
Not sure why there are not many more longnose gar in the Toronto area, since Lake Erie shorelines and Bay of Quinte to Kingston area, up into the Ottawa River, and into the St. Lawrence River as well has loads of them. Maybe there are insufficient river spawning sites to sustain a good population of them. That's the only real difference I can see. As far as I can tell, the Humber, Don and Rouge just don't seem to have the same flow and volume to provide good spawning areas (as compared to rivers like the Trent, Moira, Ottawa and St. Lawrence). What do you think? The physical make-up of the Trent, Moira, Ottawa and St. Lawrence compared to the L. Ont. streams seems to be the key from what I see. I think it is more then just water flow/volume, the big rivers mentioned have longer sustained warm temps compared to the L Ont. streams and the bottom composition is a lot different too. Sorry about the pun...... but I had to do it. I got to figure out why I am loosing so many good fish, one idea is that they are crappie and the hooks are tearing the paper lips???? I did manage to ice nearly every species that is in the lake. Bass, Perch, Blue Gill, Pumpkin Seed, and Crappie. If I had minnows I might even get those water wolves to come out an play. Like clockwork the dog started shaking like a leaf and it was time to go.... Maybe tomorrow we can figure out a way to ice those fish I keep loosing. Nice cold, crisp morning with a strong stench of dead salmon every where, a few old boots still hanging around trying to do their final ritual before turning in to more useful and rich nutrients for local scavengers and vegetation………….but not too many of the silver bullets I was looking for. Long story short, up and down the river I went chasing a handful of these highly educated and unfriendly bows without much success. 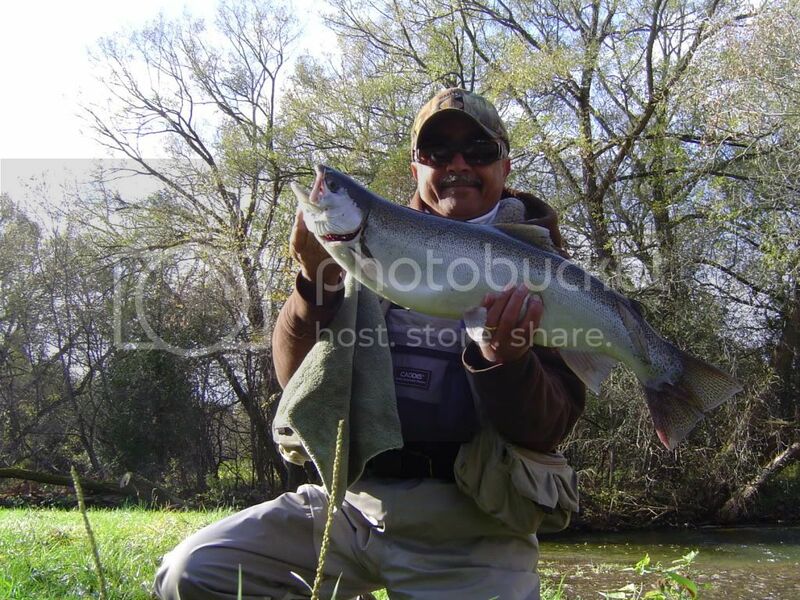 A half hearted long cast with my trusted Salmo Hornet in to one of the bigger pools and I had the rod almost ripped out of my hand,……..and my heart got a sudden big boost……. 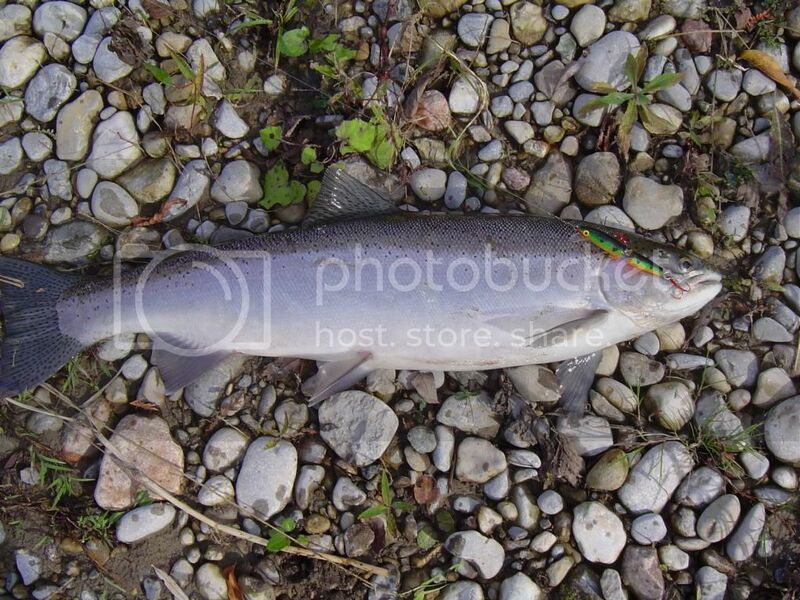 Same lure and about the 3rd retrieve, the lure was less then 10’ from rod tip, I saw a silver flash behind it and…….. BAM!! 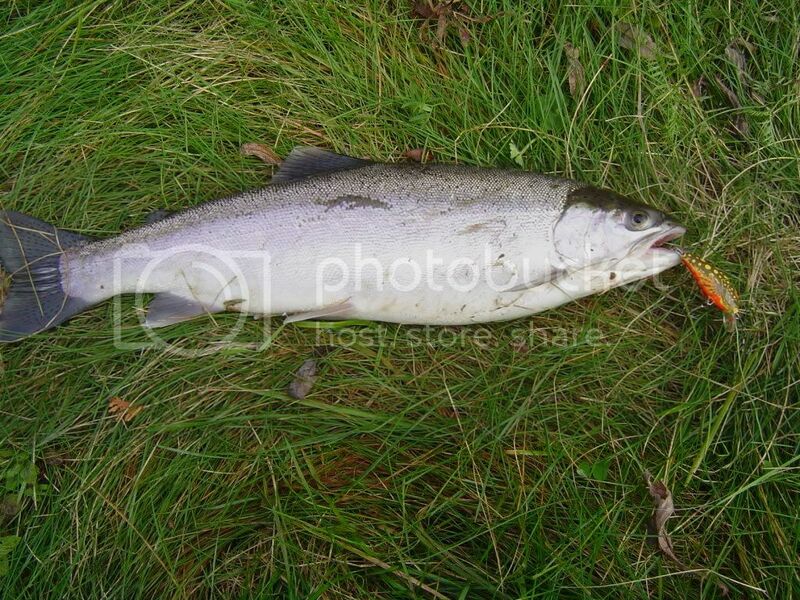 …………This time I was well prepared, but you gotta love it when you see them smash your lure in front of your eyes. I made a few more casts but I guess they had all witnessed their cousin in trouble with my Salmo so no one wanted to play any more. Tried up river and didn’t see much, so walked back down and through some thick bush to a spot I had not tried so far, on the 2nd cast with a little jointed Rapala, I got another crazy hit by this super charged bow. Unfortunately that was all the time I had today ....and besides, there wasn’t a spot I had not tried on that stretch of river today, so time to head back home………..but with a big smile. A beautiful day to be out, I love this time of the year on my favorite trib. I hope we get more cold rains and the weather co operates till the end of December. Sorry guys...as much as the cormorants are destructive, it does not warrant vigilante actions. Not only is it a concern for public safety and health safety (disposal of carcasses...although the article did not mention how or where the carcasses were disposed), it also allows precedent for similar actions. The fine is well justified in my opinion. The way that he set up nets around the island to catch flying adult is also non-selective. This method does not prevent other types of birds from getting caught in the nets and increase unnecessary by-catch. Yes, there is a ridiculous slowness in the response from MNR but it still does not allow free killing. I agree though that it is porbably cheaper to allow a certain number of free permits for licensed hunters to control the population though a cull, and I'm sure many will gladly volunteer to do so, but matters such as carcass disposal and cull locations should be discussed and approved before this cull begins. #52600 Awesome day with Colts! A buddy of mine (Pete Seto) met me at the launch at 7:15 am on Friday morning. I've known pete for 5 or 6 years and we just have never got the chance to fish together. Well after a few small fish first thing in the morning Pete had a good fish miss his bait. Discouraged we carried on. 5 minutes later....WHACK...Snap Pete's rod breaks......"@#!$%^". "Keep reeling bud he's still on!" I said. 30 seconds later I net the first 5 lb'er. "Whooo hooo....and @%! my new rod!" We carried on fishing the area but nothing more. On to another spot. I toss my bait out, WHACK! fish comes out from under pads and another monster..only for him to spit the bait back at me. Oh Well! Back at it. Fishing another spot, bait takes off..Set the hook, short fight...second 5lber. "Right on!" Pete says. We continue on and not 20 ft. from the Pete sets the hook, swing and a miss. I toss my bait in, and my line starts moving. "WHIPP"...and the fish swims by the boat doing MACH 3. "BIG FISH PETE get the net" Scoop...there's a 6 lber. What a sight seeing 2 fives and a 6 swimming in the livewell. 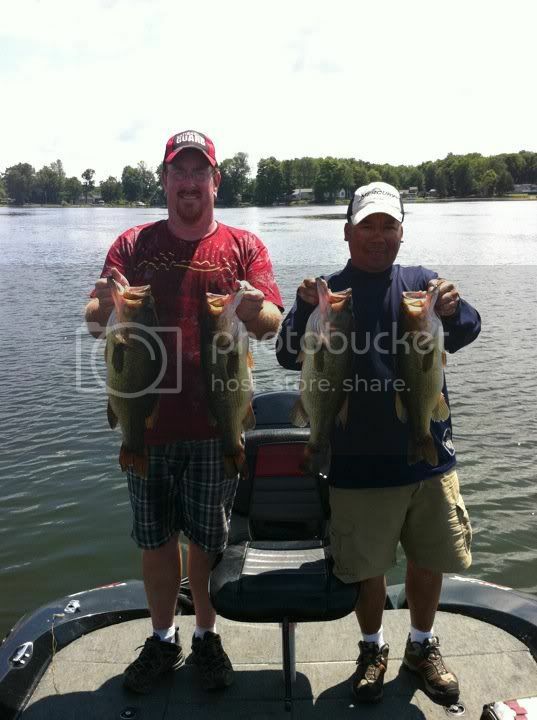 We headed to another spot and tag a decent largie 3.4 lb's and the another 2.14. Best Day of fishing i have had in a long time. Awesome weather, Awesome fishing, Awesome Friends! 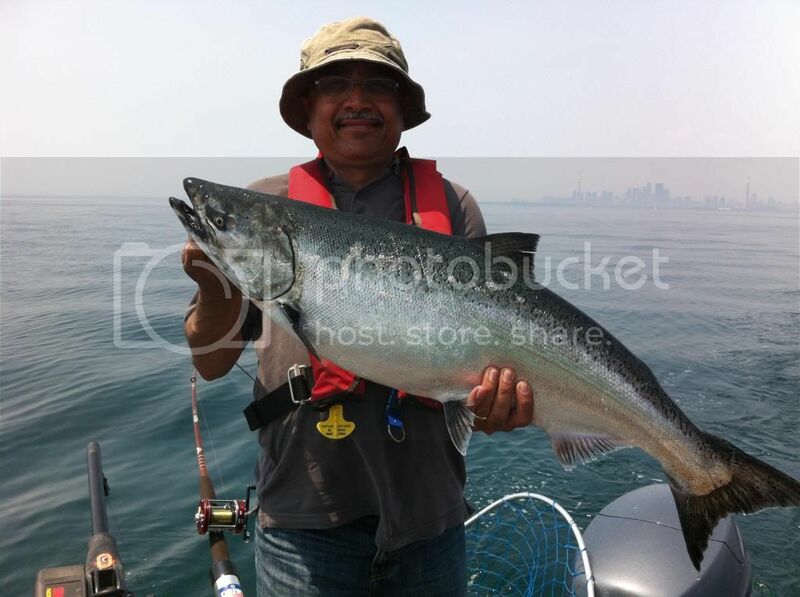 All fish were released back into the same area and were all weighed on a digital scale. Damn I love this lake.